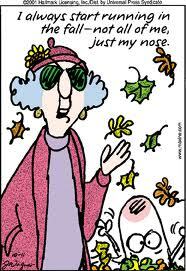 I love the cartoons of Maxine and I tracked down two of my Fall favorites. If you don't already know, Maxine is an old lady who drips with sarcasm and moxie. She is my kind of old biddy! LOVE Maxine! I actually got a email with these two cartoons and a few more a day or two and actually saved the photos to use soon on my blog so you might be seeing them there.